Nowadays it is a trend to use lenses instead of glasses. It is a fashion accessory now, yet people need a specialist that can help them to get the right lenses. And you can open an eyewear store and make a business out of this trend. Especially if you are a health specialist. You can help people improve eyesight and be stylish at the same time. And the easiest way to start is the medical e-commerce website. 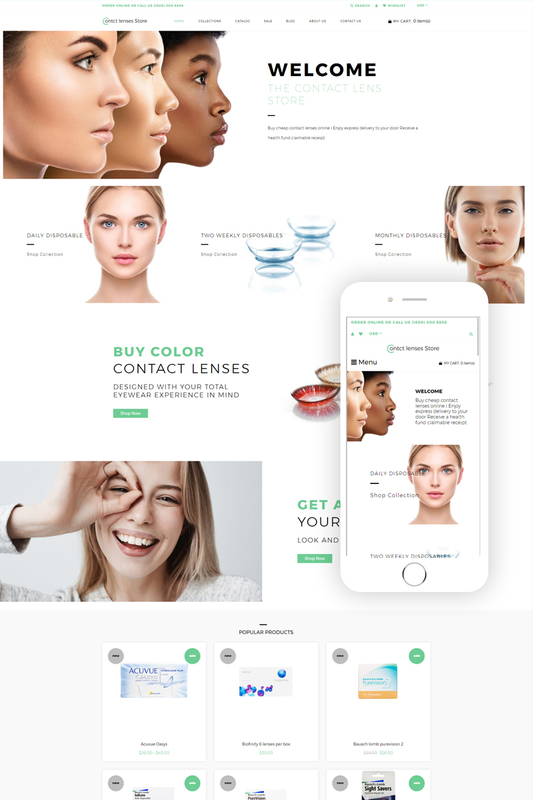 And if you want to be successful you have to use Contact lenses Shopify theme. It is eye-catchy, full of various visual effects and easy to edit. Due to the Shopify e-commerce pack, it has a cart, compare button and wishlist feature. Moreover, it also has currency options to attract customers from other regions.